Acclaimed filmmaker Ansel Faraj presents this anthology series of 11 tales of horror, mystery, and the macabre, based on the works of Edgar Allan Poe and H.G. Wells. Do you dare enter...the Theatre Fantastique? Acclaimed filmmaker Ansel Faraj (Doctor Mabuse) presents this anthology series, featuring stories of horror, mystery, and the macabre. These include adaptations of classic works by Edgar Allan Poe and H.G. Wells, as well as original tales of suspense. They star many of the cast of the original Dark Shadows -- Christopher Pennock, Jerry Lacy, Lara Parker, and Lisa Blake Richards -- alongside Academy Award-nominated actress Sally Kirkland. Every segment creates a haunting netherworld akin to that of Faraj's prior works, Doctor Mabuse (2013) and The Last Case of August T. Harrison (2015). 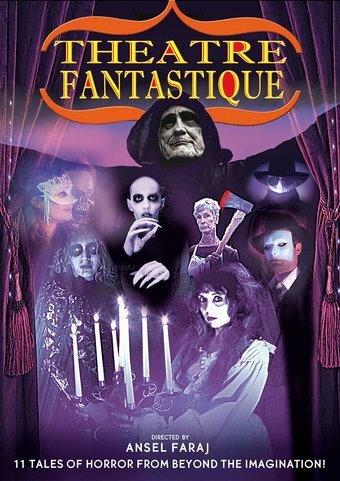 Drawing equally from Roger Corman, Alfred Hitchcock, and German Expressionism, Theatre Fantastique will stand alongside The Twilight Zone, Thriller, and Night Gallery in the annals of horror anthologies. This DVD collects 11 episodes from the first and second webseries.